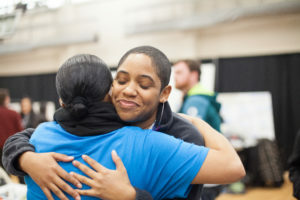 On Saturday, November 18, the Obama Foundation hosted its third and final pilot training of 2017 at the Reggie Lewis Track and Athletic Center at Roxbury Community College in Roxbury, Boston, bringing together over 150 young people to kickstart their work in civic life and to become more active in shaping their own communities. To start the day, participants watched a welcome video from President Obama, in which he shared his excitement to see the incredible work those in the room would do in the future. He also described what tangible skills participants could expect to walk away with at the end of the day. 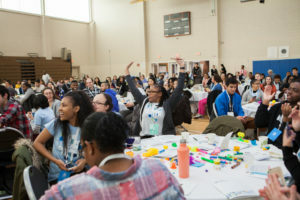 Similar to the pilot trainings in Chicago and Tempe, small groups of participants moved through a series of workshops and team challenges led by peer advisors. 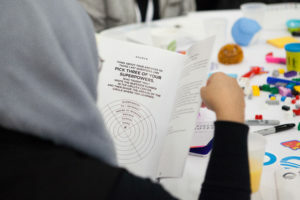 From understanding the importance and fundamentals of telling their own personal stories, to breaking issues down to their root causes and developing a “first step” to address them, everyone in the room had an opportunity to build upon their experiences and learn new ways to make an impact in their community. 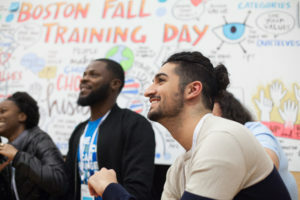 Other highlights from the day included an Engagement Fair with local organizations where participants could explore volunteer and leadership opportunities in the greater Boston area, and a team exercise on identifying personal and community assets — showing participants how well-equipped they actually are to make change. The Obama Foundation’s mission is to inspire and empower a new generation of leaders to change their communities and their world, and we hope you’ll follow along as we take what we learn from our pilot trainings across the country and develop future programming.